I love the change. Presume we’ll see it a lot of it in Birmingham. The old one: complex, busy, cluttered. The new one: simple, clean, historic. May not be the most important change on campus but it’s a good one. I like it. Simple, clean and historic, just like David Miller, a 1981 graduate of SWBTS! I love the old one. It is cleaner. It also harkens back to better days. What I liked in days of old … one could walk in Dr Naylors office open a inner door and find a map that covered a large wall. Well, what was on that map? Missionaries from all over the world … grads from Southwestern … names, countries, grads date. When we get back here we will have seen great change! I’m not sure what Mr. Beeson means when he refers to better days, but the seal being replaced definitely seems to a fuller representation of the rich history and role of the institution. It is plainly obvious to me that this shift is related to broader shifts in who will lead and how they will lead. I do come to this discussion with disconnected and prejudicial judgements about the legacy Paige Patterson and general prejudices about the new generation of leaders and religious environment they nurture an perpetuate. I have a less than positive perception of both old and new, but my faith is in neither. It seems to me that the real shift is from personal smugness in doctrinal virtue that was implicit and self expressing in its proclamation to smugness of doctrinal virtue explicitly expressed and linked to a branded entity or person. Reserving judgement for God and content to continue serve God despite my assessments, the following phrases and actions concern me. 4. The politics of purging. 5. A historical campus building similar to a Socratic temple replaces pro ecclesia. Definitely a step in the right direction. Do you know if they are still charging $25 a person to view the fake Dead Sea Scrolls at their museum exhibit? Can you believe that happened after Dorothy Patterson personally flew to Switzerland on five occasions to witness their authenticity? You can’t make this stuff up. Are the fakes still at SWBTS? 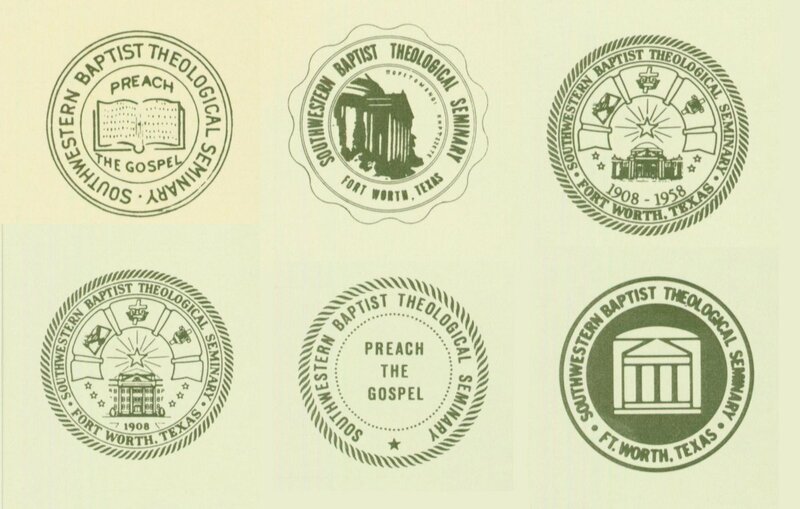 From the SWBTS archive folks via Twitter. Still like the latest the best. I do to, looks great. I am happy for this change. But can I say I’ve never seen such a fluttering and fussing over a change in a logo. Is there a backstory here I am not aware of?